The beloved Time Lord isn’t going to get a rest anytime soon. There were earlier reports that BBC Wales was proposing a series of four specials in place of a new full season. It’s now been announced that 14 new episodes of Doctor Who have been ordered by the BBC, with Matt Smith in the lead role. As in the past, there will be 13 regular adventures and a holiday special. A BBC spokesman said, “The new commission is a big commitment, not many other shows have such a commitment so far in advance.” The spokesman couldn’t say how many installments will actually end up airing in 2012. The spokesman also denied rumors that the current season was split because of financial considerations. Showrunner Steven Moffat reportedly made the decision for “narrative” reasons. Matt Smith has signed on to appear in a new series of Doctor Who, the BBC has confirmed. Fourteen new episodes of the sci-fi show, executive produced by Steven Moffat, have been commissioned. However it is not yet known when the new episodes will be broadcast. The corporation also confirmed there would be six more episodes of the current series to be screened later this year and a 2011 Christmas special starring Smith is planned. Earlier this month, the writer told the Radio Times the Daleks would be given “a rest” from the series. “There’s a problem with the Daleks. They are the most famous of the Doctor’s adversaries and the most frequent, which means they are the most reliably defeatable enemies in the universe,” he said. What do you think? Are you glad to hear Doctor Who will return? Do you like Matt Smith or would you prefer another actor in the role? More about: Doctor Who (2005), Doctor Who (2005): canceled or renewed? Doctor Who: Cancelled or Renewed for Season 11 on BBC America? Woo Hoo!!! More Doctor Who! Ecclestone was good, Tennant was great but Smith IS the Doctor!!!!!! where’s my head been? started watching the show last year with 2005 episodes. Even my 86 year old mom who rarely watches TV knows Doctor Who! Love it! I can’t believe he split the season for “narrative” effect… isn’t it bad enough that we have to try to remember what’s happened in previous seasons to understand what’s going on with River and such? Heh. Oh well, I’ll still be watching, but I hate the wait. A full renewal is great news! Can’t get enough of The Doctor!! 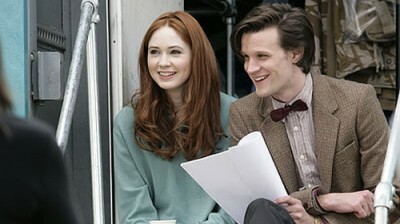 Would love to see Matt Smith and the BBC do an American season of 22 or more episodes!! Loved Eccleston and Tennant but Smith is Spot On!! Too much quirkiness if you ask me, but the show’s still fun.